How do landscapes—defined in the broadest sense to incorporate the physical contours of the built environment, the aesthetics of form, and the imaginative reflections of spatial representations—contribute to the making of politics? Shifting through the archaeological, epigraphic, and artistic remains of early complex societies, this provocative and far-reaching book is the first systematic attempt to explain the links between spatial organization and politics from an anthropological point of view. The Classic-period Maya, the kingdom of Urartu, and the cities of early southern Mesopotamia provide the focal points for this multidimensional account of human polities. Are the cities and villages in which we live and work, the lands that are woven into our senses of cultural and personal identity, and the national territories we occupy merely stages on which historical processes and political rituals are enacted? Or do the forms of buildings and streets, the evocative sensibilities of architecture and vista, the aesthetics of place conjured in art and media constitute political landscapes—broad sets of spatial practices critical to the formation, operation, and overthrow of polities, regimes, and institutions? Smith brings together contemporary theoretical developments from geography and social theory with anthropological perspectives and archaeological data to pursue these questions. Adam T. Smith is Assistant Professor in the Department of Anthropology and in the College of the University of Chicago. He is the coeditor of Archaeology in the Borderlands: Investigations in Caucasia and Beyond (2003). "If social theory in cultural anthropology was transformed in the last decades by a 'linguistic turn,' research by archaeologists into the development and practices of early states now seems to be undergoing a 'geographic turn.' 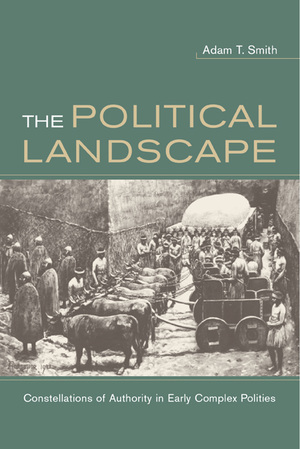 Adam Smith's book, although drawing from modern currents in geography, anthropology, sociology, and political philosophy, brings original archaeological contributions to social theory by examining the making and re-making of landscapes in early complex polities (especially in Mesopotamian, Urartian, and Maya states). Smith observes these (and other) early states as 'political landscapes,' in which monuments come to constitute authority and shape memories. Smith's book represents a comprehensive turn from metahistorical reifications of the state to investigations of how the content of social roles was determined through the production of landscapes. The landscape of archaeology will be changed decisively by this book. "—Norman Yoffee, Professor, Dept. of Near Eastern Studies and Dept. of Anthropology, University of Michigan.